A teenager who came into contact with a poisonous giant hogweed plant while doing landscaping work in Spotsylvania, Virginia, is recovering from severe burns to his face. Alex Childress, 17, told WWBT he was working on cutting down the large, leafy plant when it fell and touched his face. “I didn’t pay any mind to it because I do it all the time,” Childress said to WWBT. He said he had no idea it was poisonous, and he didn't realize something was wrong until he got home later. “I got in the shower and my face started peeling,” he said. Alex Childress is recovering at the VCU Medical Center burn unit. After his mom told him he had third-degree burns on his face and arms, he went to Spotsylvania Regional Medical Center. He was admitted to VCU Medical Center's burn unit, where he's still recovering, according to WWBT. Giant hogweed has been spotted in multiple parts of Virginia in recent weeks. The plant, which can grow to be 15 feet tall, can cause third-degree burns and blindness. Its sap strips skin’s natural ability to protect itself from ultraviolet rays. 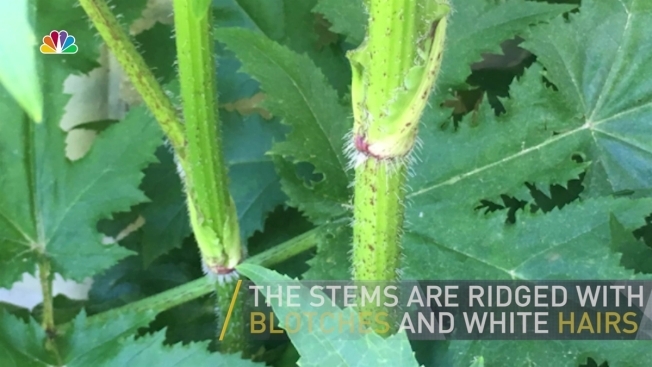 Virginia Tech scientists identified a patch of 30 giant hogweed plants in Berryville in June. A few days later, someone found the poisonous plant in between two buildings in Alexandria. The plant has clusters of small white flowers and serrated, pointy leaves that grow to 5 feet wide and look a bit like maple leaves. Giant hogweed is in the carrot and parsley family and reportedly comes from the Caucasus Mountain region between the Black and Caspian seas. It was introduced to the U.S. as an ornamental plant in the 20th century, a University of Maryland publication says. The plant can be confused with cow parsnip, which is native to Virginia. It is on the Virginia Invasive Plants Early Detection Species list, meaning it is not widely established in the commonwealth but is highly invasive in similar habitats.